MarineTraffic provides a provides information about current geographical positions of ships as well as other related information, whenever available, such as ships’ details, their destination, estimated time of arrival, photographs, port traffic statistics, weather conditions, points of interest, etc. MarineTraffic is a global pioneer in AIS vessel tracking. This service could be useful for MSP processes. What does a comprehensive maritime database offer? How can I find out more about vessel positions and port related events to use these information for my planning? How does an AIS vessel tracking work? How can I get a quick overview of thousands of marine assets are available (vessels, ports, lights)? MarineTraffic aims to present global AIS data and intelligence to power projects of the economic sector sourced from a terrestrial network and enhanced with satellite data. It shows past, present and future data all in one place and tries to make big data simple. Through harnessing the power big data from integration with apps and platforms it facilitates the spreadheet of reports and deliver of API services. A side-effect is that MSP stakeholders can make use of this source of data. The database records 800 million vessel positions and 18 million vessel and port related events monthly, see Figure. Details of over 650 thousand marine assets are available (vessels, ports, lights). 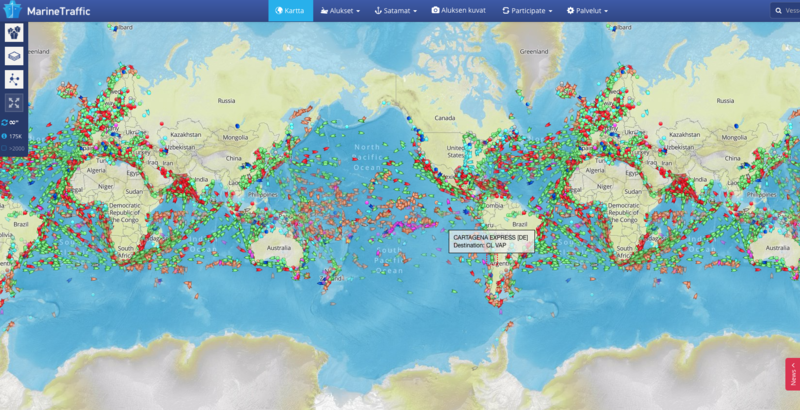 MarineTraffic sees itself as the global pioneer in AIS vessel tracking. Registered users of the Website are able to use certain extra Services and can access extra Data, according to their Plan specifications. Non-registered users have limited access to data. Vessel particulars including type, dimension, ownership etc. Additionally, academics can ask the Academic Relations Team for support on their research project or when looking for data. Registered users can create a quick-search for vessels or move around the Live Map with different layers and filters. Also the display of wind or density on the Live Map is availabe. By using the MarineTraffic.com website, the mobile applications, API, premium services, or other information provided as part of the MarineTraffic services, the user is entering into a legally binding agreement, and become a MarineTraffic user ("User") he has to pay for. There are also services for free available ("data for all"). The provider of the Website is Exmile Solutions Limited, London, United Kingdom.